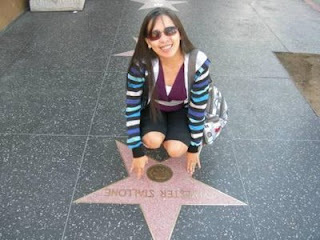 When you say you want to "see stars" in Hollywood, - it connotes 2 things; - seeing the bronze-star-plaques embedded in pink and charcoal terrazzo squares on the world's most famous sidewalk - (Hollywood Walk of Fame), and seeing actual Hollywood movie stars walking either on the streets of Hollywood Blvd. to the streets of Beverly Hills. We always wanted to see both, right? The Hollywood Walk of Fame extends on Hollywood Blvd. from Gower Street to La Brea venue, and on Vine Street from Yucca Street to Sunset Blvd. These stars embedded on the sidewalks honors various celebrities, famous radio, TV and stage performers, directors, singers, and all other well-known personas.